In just a few days, NextCrew will be participating in the Staffing Industry Analyst Conference being held in San Diego California. From March 18th through the 21st executives from all over will convene to discuss the latest news and technology in staffing. We are very excited to have our product and company showcased at the event. We want to invite everyone attending to come see us and talk about what we can offer. We are very proud of our product and believe that our online staffing platform will be a game changer in the industry. Before you speak with us we know you have some questions about what makes NextCrew stand out from the competition. What makes us cool? Here are some of the features our management system offers our partnering clients. White label branding to match your existing website and marketing strategy. Employee self-service platform which allows employees to stay engaged with your company. 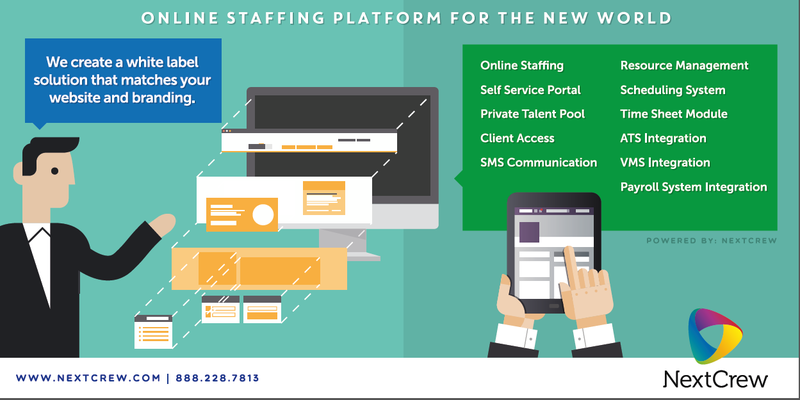 Easy to use system to leverage the current trend of online staffing for your business. The ability to create a private talent pool customized for each of your clients based on their requirements and locations. Your star candidates will never fall through the cracks again. Our easy to use system can streamline your staffing business and allow your recruiters to focus on what they do best: source more talent for your clients. In just two years NextCrew has grown significantly. We have expanded to work with clients all over the United States, Canada, and the United Kingdom. We work with companies to create a customized system that bridges the gap between applicant tracking and payroll processing. We want to partner with you! Visit us at the Staffing Industry Analysts Executive Forum in San Diego. We look forward to seeing you there! Visit our website and contact us for more information. We are NextCrew: Online Staffing Platform for the New World!